Step into a high-tech, laser tag adventure where identity is limited only by imagination. Dodge lasers, and strategize with teammates as you compete for high scores and glory in this futuristic version of Capture the Flag. Whether it's a business meeting, Birthday Party, or Club Fundraiser, Gearworks Laser Tag & Video Arcade transforms the routine into the extraordinary! 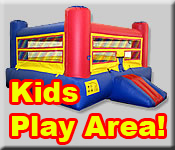 At Gearworks Family Fun Center, we use the latest technology for safe, exciting fun. Players of all ages keep coming back for more. Over 1,000,000 players have played in our incredible laser tag arenas. Next, they enter the vesting room where they put on their laser packs and prepare to enter the arena. Finally, the game begins as each team enters the laser tag arena. Smoke fills the air as the players quickly scatter into the dark labyrinth of corridors and ramps! Even if you are not playing, large plasma monitors in our lobby allow you to follow along with play-by-play action and scoreboards as the laser tag action unfolds. Or, feel free to watch the live action from our observation deck! ® 2019 Gearworks Family Fun Center, a BusinessVentures.com company. Content by Rick Rahim.